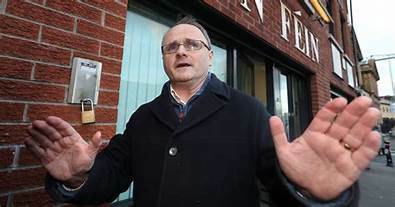 The following is an article about the ousting of Barry McElduff, Sinn Fein MP for West Tyrone, after his notorious tweet. This article first appeared in Socialist Democracy (Ireland). A sustained campaign of outrage has led to the ousting of the Sinn Fein MP for West Tyrone. The campaign arose from the posting of a tweet showing the MP balancing a loaf of bread on his head in a supermarket declaiming; “where do they keep the bread?” Unfortunately the bread was from the Kingsmill bakery and McElduff’s antics were on the anniversary of the IRA sectarian massacre of ten protestant workmen at Kingsmills.